Paneer Butter Masala: Paneer butter masala is one of the most popular paneer recipes in Punjabi cuisine. The near perfect combination of spiciness and creaminess of its gravy makes it simply irresistible and versatile to be served with any Indian bread (tandoori roti, naan and paneer kulcha) or with steamed rice or jeera pulao. Paneer butter masala gravy is made of tomato puree and the regular Indian herbs-spices. Heat the oil and butter in a pan, on medium heat. Add in the bay leaf. Fry for 10-15 seconds or till the oil become fragrant. Fry till the raw aroma disappears. Stir well and cook for about 5 minutes. Sauté till the oil starts to leave the sides of the tomato paste. Add in the cashew paste. Sauté the cashew paste till the oil begins to leave the sides of the pan. Stir and simmer on a low flame. Season the curry with salt and sugar and simmer till the curry begins to thicken. 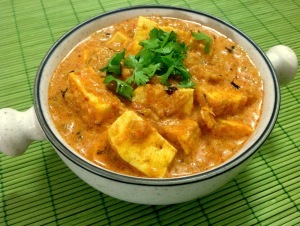 Add in the paneer cubes and cook the curry for 2-3 minutes till the paneer become soft. Add the crushed dry fenugreek leaves and garam masala powder. Garnish the paneer butter masala with coriander leaves. Serve paneer butter masala hot with either plain naan, garlic naan, rotis or steamed rice or jeera rice. Addition of sugar depends upon your taste as well as the tanginess present in the tomatoes. If you add cream in the recipe then you might have to add less sugar. 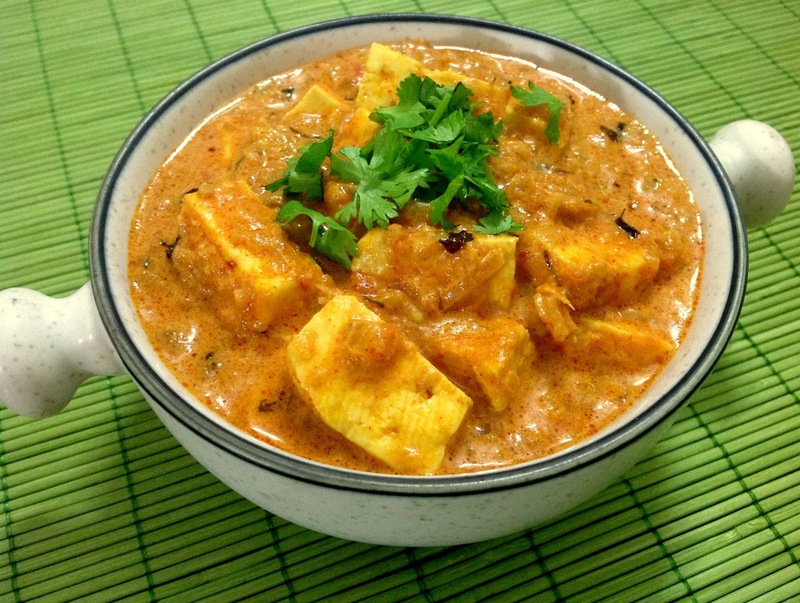 If you have any queries regarding the Paneer Butter Masala recipe, please leave a comment.